The City of Lynnwood invites you to participate in an open house to learn about Scriber Creek Trail improvements. Envisioned as a shared-use transportation and recreation facility, the trail will provide multi-modal connections between homes, businesses, parks, the Interurban Trail, the transit center, the future light rail station, and future bus-rapid transit routes. 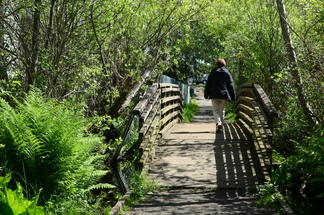 The project will improve existing trails in Scriber Lake Park and Scriber Creek Park, and create a new connection between them. 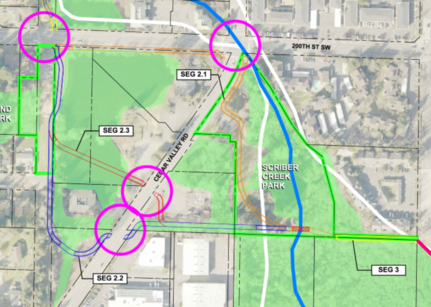 The City is contemplating two alternative alignments to connect the parks that will avoid developing the trail adjacent to a road. Please see the map above or visit the project website. The feedback from the open house will inform the selection of a preferred alignment that will be advanced for design and environmental review. We need to hear input from you about these proposed improvements! What is important to you? Let us know by participating in the open house! For more information, visit our project page - we hope to see you there!